Wilfrid Laurier University’s varsity swimmers Jasmine Raines and Tyson MacDonald are all set to compete at the 2019 Canada Swimming Trials. The trials will take place from Apr. 3 to 7 in Toronto as MacDonald and Raines will get the opportunity to eventually represent Canada at the international level. “I’m really excited. This will be my second time competing at the trials. The first time was so much fun. I love being there with the best swimmers in Canada and getting a chance to compete against them. I get to learn so much from just watching them,” Raines said. The competition will be tougher than anything that Raines and MacDonald have faced so far this season and qualification will not be easy to achieve. The Kitchener native qualified for the trials at the U-Sports National Swimming Championships in February. Raines has already had a decorated collegiate swimming career and she will now look to take the next step by competing at the international level. 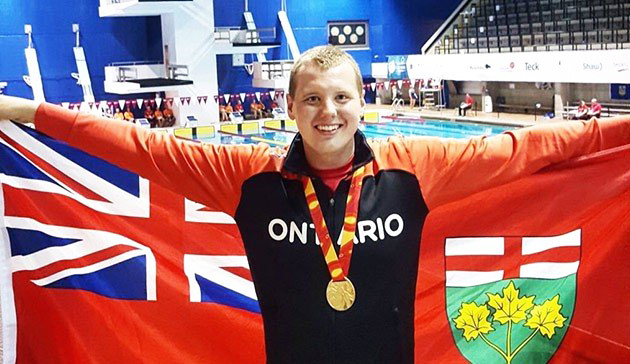 Tyson MacDonald acquired his international classification at the World Para Swimming Series in Australia in February earlier this year. Swimming in Australia was a valuable experience for MacDonald and he will now look to carry that experience into the Canadian Swimming Trials. MacDonald will swim in six different races featuring backstroke, breaststroke and freestyle swimming events. Raines will swim in the 100 and 200-metre breaststroke events. The Canadian Swimming Trials will also offer the two swimmers a chance to figure out their swimming future once they graduate from Laurier. Competing for Canada enhances every athlete’s reputation and it can go a long way towards developing one’s athletic career at the professional level.